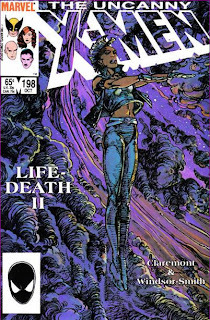 "Lifedeath: From the Heart of Darkness"
Storm heals and comes to term with her power loss in a small African village. In East Africa, a wounded and delirious Storm is caught in a sandstorm. Finding shelter in a cave, she hallucinates being joined by her fellow X-Men, who force her to choose between life and death. She chooses life, and when the storm clears, emerges to discover a bus crash caused by the storm. The only survivor is a very pregnant young woman named Shani, who is returning to her village after leaving to experience the city. She and Storm travel there together, and as they near the village, Storm is struck by the broken down farming equipment and once-fertile land that has been rendered dry and arid. When they arrive, Storm's wounds are tended to by the village elder, Mjnari, who remembers Storm from her previous time in Africa. Days later, Shani goes into labor, and lacking access to a hospital, asks Storm for help. Despite her lack of training, Storm is able to hep Shani with the difficult delivery, but the child isn't breathing when he emerges. Storm performs mouth-to-mouth, and is able to coax life into the infant. Amidst the ensuing celebration, Storm observes Mjnari leaving. Following him to a nearby mount, he explains that in ancient times, his village lived in harmony with nature. Then the white man arrived, and promised wealth via modern farming equipment and techniques. Though the village prospered for awhile, eventually the fields became over farmed, wars disrupted the flow of oil and spare parts needed for the machines, and the prosperity ended. The village was forced back into harmony with nature, and now, for every life born another must die. Realizing Mjnari intends to die, Storm feels guilty for saving Shani's child, but he insists she view his birth as he does: representative of new hope for the tribe. He is bridge between the old generation and the new, between ignorance and knowledge. As Mjnari dies, Storm realizes she too is a bridge, between man and mutant, and though she no longer can fly above the earth, her heart and soul soar higher than the stars. 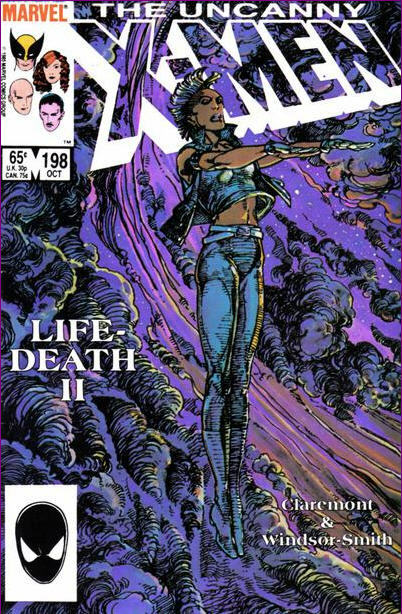 This issue is a spiritual sequel to issue #186's "LifeDeath", once again starring Storm and featuring Barry Windsor-Smith on art (here does the coloring as well as the pencils and inks). 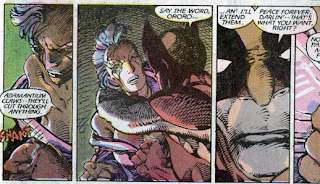 Claremont and Windsor-Smith intended to make the series a trilogy with a third issue, but that issue, after being drawn by Windsor-Smith, was ultimately rejected by Marvel and later self-published by the artist, as detailed here (hence, the lack of follow-up to this story's concluding idea of Storm as a bridge between man and mutant). Claremont and Windsor-Smith would, of course, team-up for two more X-Men issues, #205 and #214, though both of those break the "LifeDeath" model established by #186 and #198). Claremont has said that it was during a planning meeting for this issue that he first learned of Marvel's plans to resurrect Jean Grey. Apparently, had Claremont been able to, he would have marched up to Jim Shooter's office and quit on the spot. But the planning session was held on a Friday night, after the Marvel offices were closed, and that, along with the subsequent weekend, gave him enough time to cool off that by Monday, he was no longer as fired up (though presumably still pissed off). The corner box has been temporarily altered to include just Wolverine, Professor X, Forge and...Jean Grey, I assume? Storm next appears in New Mutants #32-34, all of which occur between this issue of X-Men and the next. 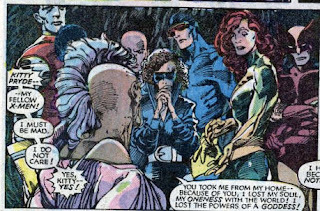 When Storm hallucinates the presence of the X-Men, Kitty is wearing her most recent blue costume, yet Storm has never seen it (she left New York in issue #192, before Kitty first wore the costume). 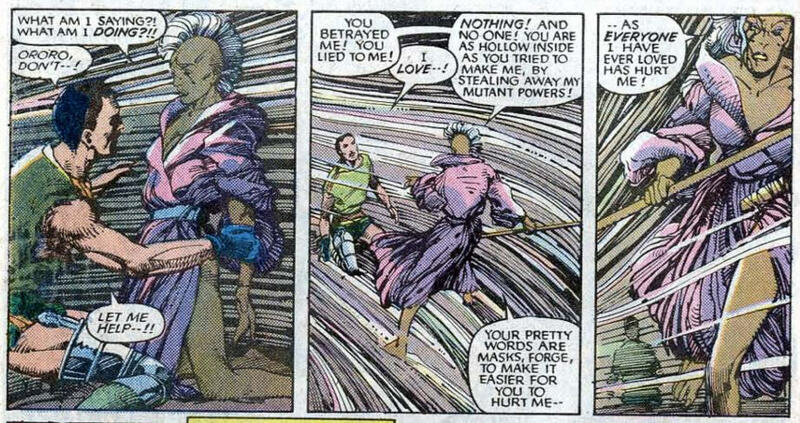 In what is either a nice, subtle callback to "LifeDeath" or just a happy coincidence, Claremont describes Storm's happiness at one point bubbling up like champagne; she first tried (and enjoyed) champagne in issue #186. 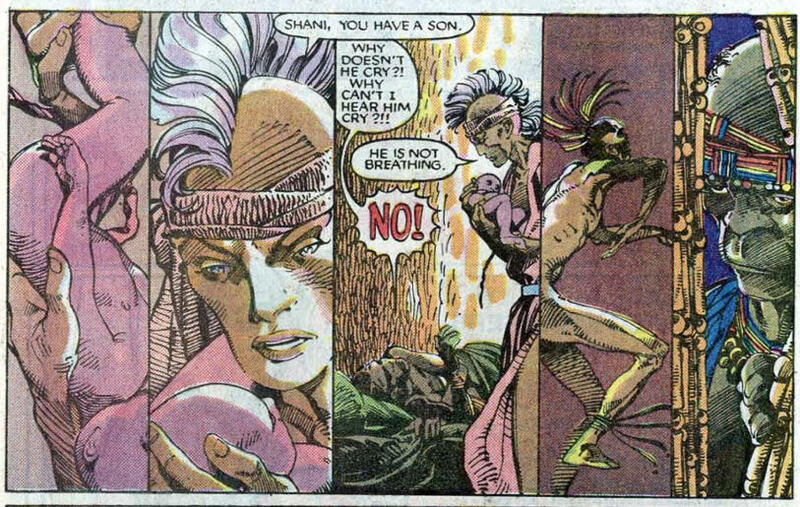 Storm expresses both her love and hatred of Forge as she hallucinates him. Wolverine is expository about his claws even in hallucinations. 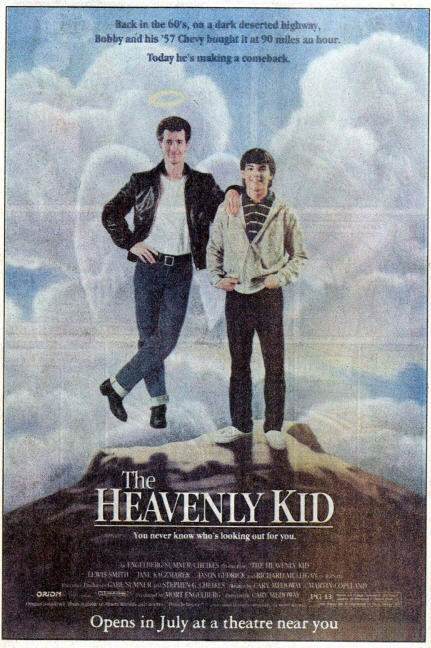 This issue features an ad for a movie called The Heavenly Kid, a movie I've only ever seen referenced in print ads of comics from around this time. 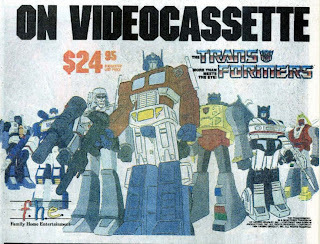 There's also an ad for a Transformers VHS recording of the show's original miniseries, once again for the "low" price of $24.95. 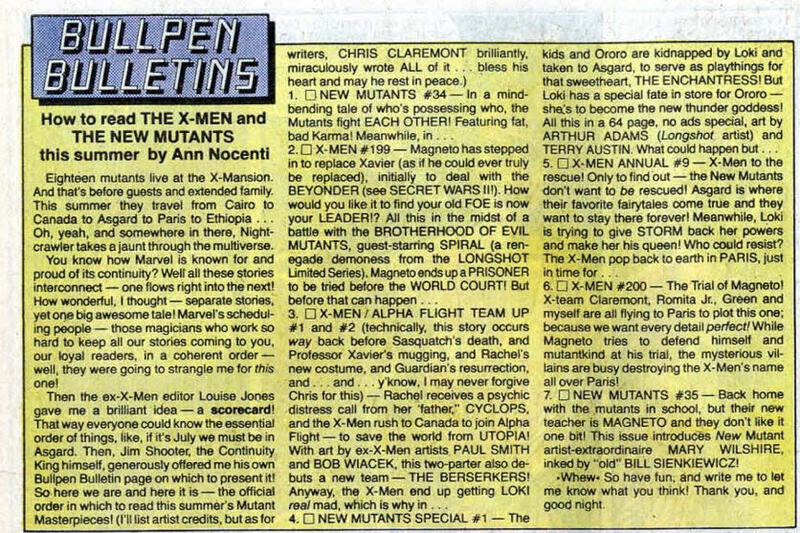 Ann Nocenti pens a guest-editorial which offers a reading guide to the various X-titles being released in the forthcoming summer, the first (but not the last) such guide to the franchise to appear in the book. As with the previous "LifeDeath" in issue #186, this is one of the more critically lauded issues of Claremont's run, and like that issue, there's no denying the level of craft on display, both from Claremont (who, after an opening section which contains far too much overly-wordy and whiny internal and external monologuing from Storm, is able to settle down and more or less gets out of the way of the art) and his returning artistic collaborator, Barry Windsor-Smith (who once again turns in strong work, particularly in the realm of body language and facial expression). But like "LifeDeath", this one similarly leaves me cold, something I can appreciate on an intellectual level but little else. 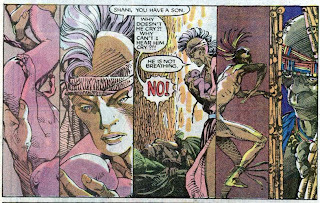 Part of that, as with the previous Claremont/Windsor-Smith joint is how self-contained it is: to its credit as an individual issue, the story is entirely focused first on Storm's immediate survival and then on her interactions with a small African village. 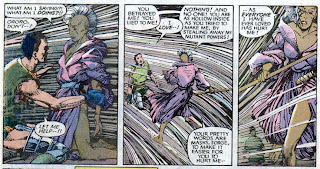 There are no cutaways to the other X-Men (who only appear as a hallucination) or any events outside of Storm's surroundings (even issue #186 featured a few scenes with other X-Men). But what helps this issue succeed as a story in and of itself also detracts from its role as a chapter in a larger narrative, as the ongoing story of the X-Men could more or less be read without this story. My other hangup with this story is when its taking place relative to the series. Though much of Claremont and Romita Jr.'s run has been defined by a lack of clearly-delineated story arcs, there has been a sense that the last several issues (starting with the formal contextualization of the X-Men as outlaws in issue #193) have been building towards something significant. Perhaps that's the benefit of foresight at work, as I know, reading this issue now, that significant events are in store for both this book and the X-Men franchise only a few months down the road. But I'd like to think that even reading these issues without specific knowledge of what is coming would create a similar sensation, if nothing else than because the milestone issue #200 is right around the corner. While both this story and the previous one address necessary character developments (the Kitty/Colossus relationship in the former, Storm coming to terms with her power loss in this one), they both seem to sap the ongoing narrative of forward momentum. The end result is that I while can appreciate this issue on an intellectual level, for the level of craft on display, I have a hard time enjoying it as anything more. Tomorrow, the New Mutants continue their battle with Karma in New Mutants #33, and next week we look at the Longshot miniseries. Ororo did not leave in the present story depicted in UXM#192. She is gone in UXM#193, set a few months later. Between those issues is her presence at the UXM Annual 8 where she is present. Wasn't Kitty wearing her new garb when the team (with Ororo) searched for Magus in 192? If I'm wrong about that, I still believe there was enough time for Kitty to show Ororo something of her new costume design. Funny how you bring up the redhead on the cover. Her identity has been bugging me ever since I was a little kid. I never actually read the issue, but it sounds like no other main characters feature in it besides Storm. I always assumed it was a mis-colored Rogue or another redhead/brunette like Moira MacTaggert. Overall, I have never been a fan of Lifedeath 1 or 2. The art is just not for me and the stories are meh. @Angmc43: Wasn't Kitty wearing her new garb when the team (with Ororo) searched for Magus in 192? I'm pretty sure her blue Shadowcat costume first appeared in #193 (a version of it, anyway). She had just returned from Japan in #192 and was, I think, in plainclothes when the X-Men investigated Magus. @Ian: I always assumed it was a mis-colored Rogue or another redhead/brunette like Moira MacTaggert. The presence of that redhead has always bugged me too. I've taken to assuming it's supposed to be Phoenix, simply because she does appear, sort of, in the issue. But at the same time, it isn't like she did all that much, so it's unclear why they decided to put her in the corner box. Agreed. And if the idea was to get people excited about a Jean appearance, man, I bet anyone who was got disappointed. Ha! That's great. What's it about (I could just look it up on IMDB, but I'd rather it hear it from someone who has seen it)? The stuff with the village comes off as a bit earnest in retrospect, which I suspect is due to me, our culture, and mainstream comics all having grown up a bit since it was created/published. I still find the issue lovely overall, though. BWS fires on all cylinders with the art; Claremont is largely restrained and, at the same time, the gist of the story lends itself well to his more florid tendencies (or vice versa). I'm actually much fonder of this issue than the first "LifeDeath" specifically for its remove from the ongoing X-Men action. #186's inclusion of the Dire Wraith stuff really compromised what to me was its specialness — of course, your mileage will vary if you don't like Windsor-Smith's style; outside of his tendency to give everyone the same vaguely exotic face, I do. It doesn't hurt that there's no Forge here, either. To me this issue's "separateness" echoes, before the fact, the sort of break between larger, longer stories that James Robinson included under the Times Past rubric in Starman — a motif borrowed, I always thought, from Neil Gaiman's Sandman just as Robinson incorporated the legacy aspect of Mark Waid's Flash into the mix. 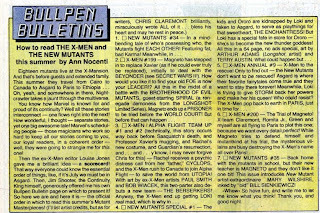 Of course this issue is happening roughly concurrent with the ongoing action in X-Men rather than decades or centuries before, and unlike certain Times Past issues or stand-alone issues of Sandman I gather it didn't pay off much in the main narrative when Ororo returned to the team (which regardless of the loss of the third chapter of the planned trilogy, given the final pages of this issue, one would assume it should). One nitpick of mine that admittedly can likely be explained away by the fact that Storm was delirious is the psyche-out over her powers returning oops no they didn't. I never get why characters who suddenly lose their powers and/or suddenly regain them don't know inherently that that's happened before testing them out. With certain abilities I can buy it, but Storm's whole shtick is being one with nature, so if that connection has been severed and/or reestablished you'd think she'd know right away — perhaps she'd be skeptical, but she should feel it in, as Claremont would say, her heart of hearts, her most secret self, her totally private no-trespassers locked filing cabinet of the soul. The ad for The Heavenly Kid really stood out to me because I have absolutely no memory of it either at the time or since. Jason Gedrick's name surprised me, too, because I don't recall having heard of him until the neat experiment that was Stephen Bochco's Murder One. @Blam: Claremont is largely restrained and, at the same time, the gist of the story lends itself well to his more florid tendencies (or vice versa). It doesn't hurt that there's no Forge here, either. Though I'm not a huge fan of either issue, I probably would lift this one above #186 (despite it being even less connected to the X-narrative) simply because of Forge's absence and, to a greater extent, the fact that it isn't chiefly concerned with selling us on a Forge/Storm romance that never quite clicks. Indeed. Also, this coming when it does seems to have more of an detrimental effect on the momentum of the book's ongoing arc, such as it is, than the examples of similar stories you mentioned. ...perhaps she'd be skeptical, but she should feel it in, as Claremont would say, her heart of hearts, her most secret self, her totally private no-trespassers locked filing cabinet of the soul. I thought Storm roughing it in Africa was a pretty kool thing to see in an X-Men comic book. @Reese: why didn't you have an "Artistic Achievements" for Shani giving birth on pg. 16? I thought that was pretty..artistic? It certainly was, though it didn't necessarily stick out to me, hence the lack of mention. As with Lifedeath 1 , I really enjoyed this issue, probably more than part 1. I didn't mind focusing solely on Storm. It was a nice way to cap off her character arc. 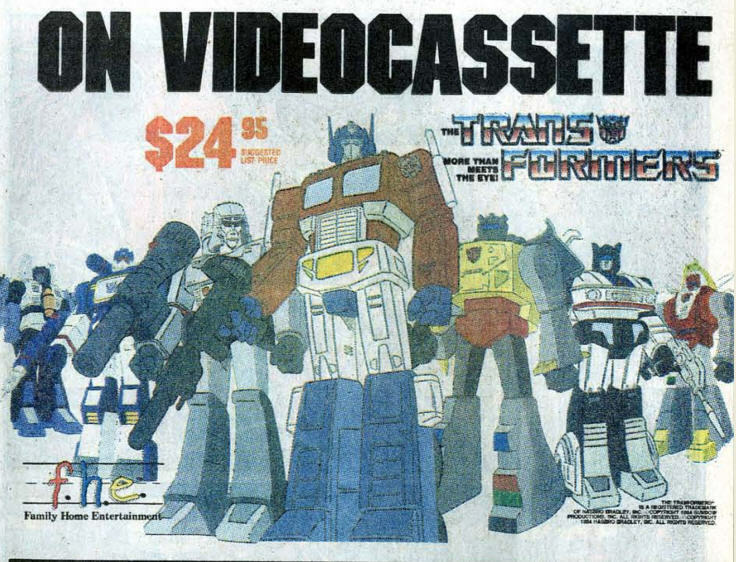 I did like the "Spotlight On..." issue we got during this era. I didn't think it hurt the pace, I think it helped. a change of pace was always nice, and it was a nice break before the next issue's set up for #200. I like this issue and the other one more in concept than execution. And to be honest BWS isn't my cuppa. I've been missing Storm in the last few issues but this is too much of the Storm I don't care for. The overly dead serious side of her personality. The plain folks line seems out of place and how did she heal are my nitpicks. I guess I more like the ensemble of X-Men, which is probably the reason I never really liked any of the solo titles. It's all about the team dynamic for me. And I thought it was obviously Jean on the cover. Those four characters are who she has an emotional connection with. I'm having deja vu. Did I leave a comment here? Am I shadow banned? Damn you, Internet! Suffice it to say: meh. No, not shadow-banned. Any comments older than two weeks have to be manually approved (an effort to cut down on spam) and I've just been lazy about going in and approving a bunch of your comments on older posts. They should all be there now, and I'll hopefully be more on the ball in the future. Sorry!